Stress is something we all face on an daily basis and it can be a difficult challenge. 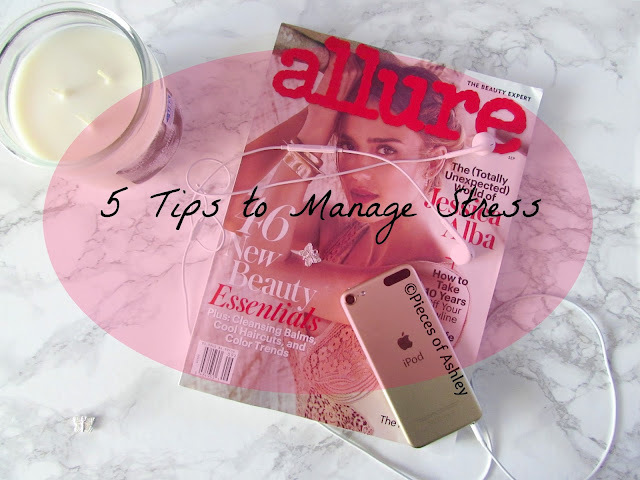 Even though the title is tips to manage stress, everyone handles it differently. Stress can cause anxiety and that is not good at all. Anxiety is really not a great feeling to have, I know my chest gets a funny feeling and I start getting hot. Has that ever happened to anybody? I know for me I have a few ways I like to manage stress. It's alright to take a step back and breathe, sometimes you just have to take a break period. When I'm stressed out I feel like jumping out of my body and running away, if that makes any sense. I won't go into a rant because it would just be me saying how I yell and throw a tantrum like a two year old. Although I am only 24, I feel my patience is wearing thin. For example, the other day I was at the grocery store and it was really crowded. Everyone was bumping into each other and I started getting pissed. It's like "where are you going, there is no where to go, slow down". Anyway I decided to share my "tips" and what I like to do to manage stress. I'm no expert these are the things that work for me. But hopefully these ideas help someone else! 1. Music: I love listening to music! There is not enough time in the day to talk about my love for it. This is my happy place when I am by myself or with other people. When I am sad, pissed off, happy, anxious, and obviously stressed music calms me down. Whenever I'm feeling tensed I will turn on the music. I love pop, r &b, rap, hip hop, latin, reggae, a little bit of rock and country. You're probably thinking "she just named basically every genre". I get it, but sometimes I feel the need to explain everything so you'll get me. Maybe we can share our interest in music! 2. Writing: Surprisingly writing is comforting for me. Whether it is writing ideas for my blog, writing on Twitter or Instagram. When I was in high school I would write little poems during class. Now looking back I realized how creative I was. A longtime ago while watching television, I can't remember the show but someone was upset and wrote their feelings on paper. After that they threw the paper in the garbage. I think that's a great technique. Also writing in a journal or diary helps, when I was younger I had a lot of them. Remember the ones that had a lock and key, I felt so responsible! 3. Drawing/ Sketching: My dream is to become a fashion designer. This has always been my dream since I was in the 4th grade. If you want to checkout why here's a post I did awhile ago: Dream of being a fashion designer. Drawing flowers and sketching dresses is a great stress reliever for me. I have not sketched in a longtime. But I am slowly making my way back. In high school I remember drawing a full dress with all the details, in one class period. I probably should have been listening to the teacher! 4. Reading: I wasn't ever into reading books, but if you're a book lover this can be a way to relax and relieve stress. However I do love reading magazines! My favorites are Us Magazine (Us Weekly) and People Magazine. I'm into reading celebrity gossip and the latest trends or beauty tips. But if you're not into that you can read some inspirational/ motivation quotes. These really help get out of a rut if I am feeling the blues. 5. Exercising: Whether it's walking, running, taking up a dance class or watching a dance workout dvd, it helps. It doesn't have to be a hour long, 15 to 30 minutes is fine! Walking is really calming and soothing for me. I have a playlist with all my favorites so it doesn't get boring. What I would like to do is take up a kick boxing class. I'm pretty sure that would release a lot of stress. I hope you enjoyed reading and if you use these already or have any other tips let me know! Great post, I can relate so much! I don't necessarily have anxiety, but I have experienced feeling anxious in certain times of my life and it's a horrible feeling! Lately I've been pretty stressed due to various things happening all at once - seems to be the way of life haha! I agree with listening to music and also the drawing - I used to do lots of art in school and college, but it all took a step back throughout uni and now I've graduated I'm trying to take it back up - starting with designing my twin sister's tattoo! My weird one thought is cleaning...I find cleaning the flat, scrubbing the bathroom etc. quite therpeautic. Is that weird? haha.